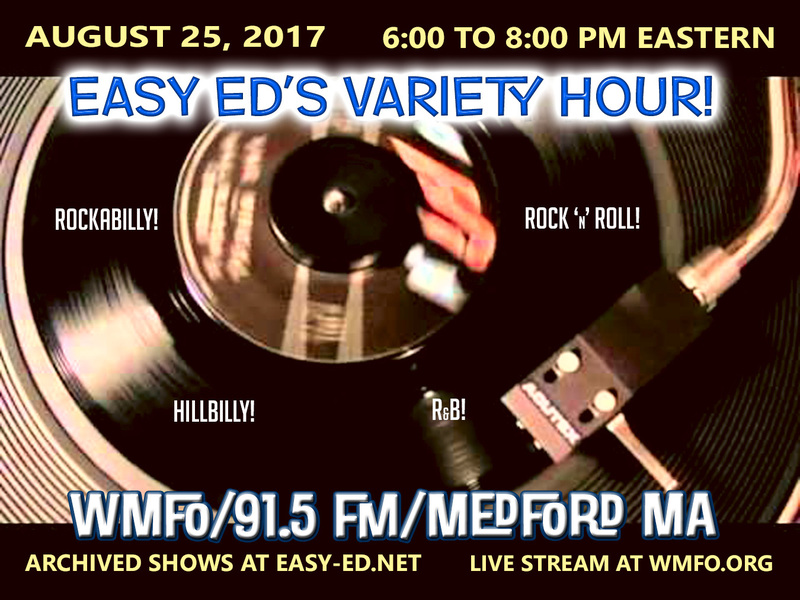 Easy Ed's Variety Hour (August 25, 2017 Show) and Lots More! First off, if you missed last Friday's show you can find the always-free archive MP3 right here, along with several years' worth of back episodes. I hope you enjoy it. If you do, let me know by hitting that Send Message button on our Facebook page. Thanks! The songs from this show are listed at the bottom of this blog post. We paid tribute to Sun Records great Sonny Burgess, who died on August 18, and talked about the upcoming New England Shake-Up Festival (great lineup! ), as well as our expanded Primitive Sounds DJ night schedule. Read on details. 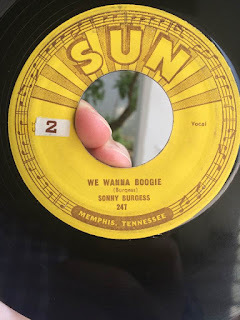 I feel fortunate to have seen Sonny Burgess perform several times--most recently at the Nashville Boogie this past June--and he never failed to put on a great show. I DJ'd a show he did in Boston a few years ago and another at the Red Hot and Blue Festival. 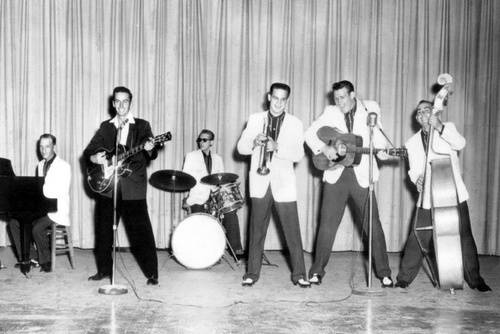 He always seemed to have fun on stage, and had a positive attitude about playing live and show business in general. This past Saturday I purchased a lot of 45s from a junk store, and buried in one of the boxes was a clean copy of "We Wanna Boogie." Other clues in the boxes indicate that this was a '50s/'60s-era collection from a local resident. 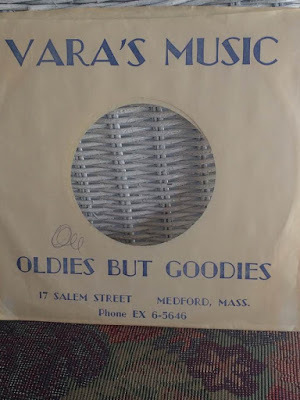 I've read that "Red Headed Woman" (the flip of "We Wanna Boogie") was popular in Boston when it first came out in 1956. Junk-Store Score. 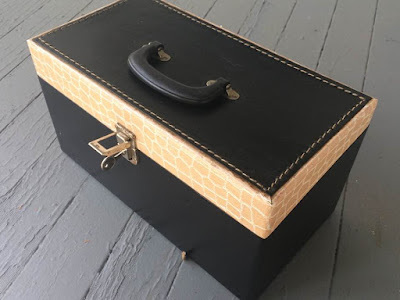 These Double 45 Boxes are Getting Hard to Find. 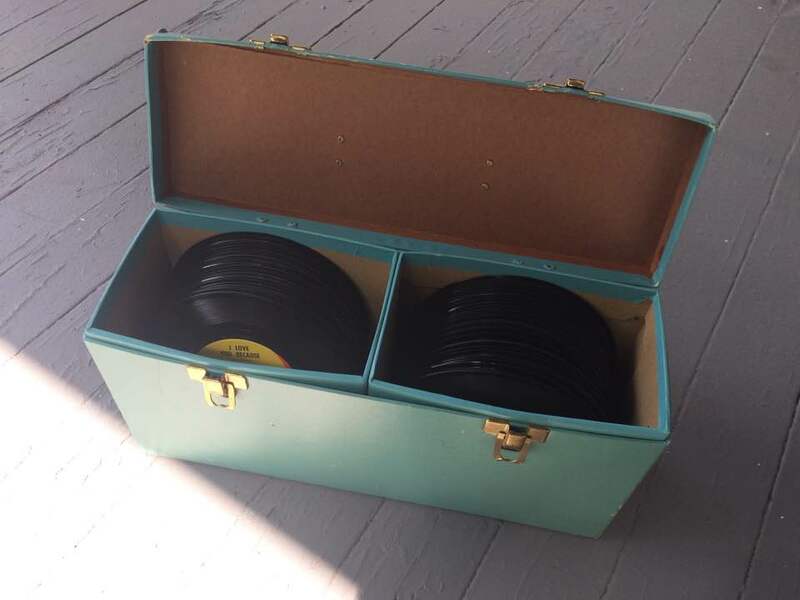 The Box Itself Ain't Much, But the Records Were Desirable and Very Clean. 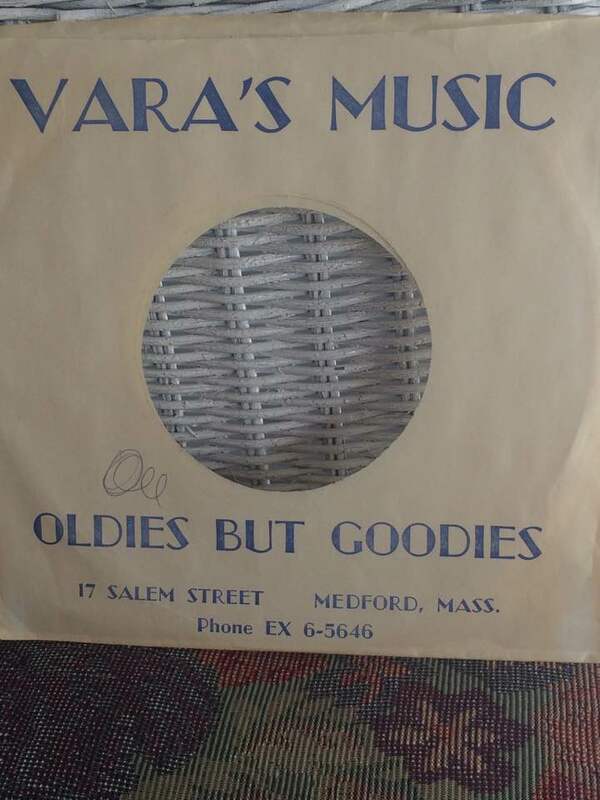 Couldn't Find Much Info Online About This Long-Gone Shop Once Located Near Medford City Hall. The New England Shake-Up (September 22-24 in Sturbridge, MA) is crazy-fun rockabilly party featuring excellent bands from around the world, a hot rod show, dance lessons, and all-night record hops. Year five's band lineup features Sweden's Go Getters, The Barnshakers (Finland), Big Sandy and His Fly-Rite Boys, The Lucky Stars, Furious, Rockin' Lloyd Tripp, The Starjays, Lil' Mo and The Unholy 4, The 24th Street Wailers, and lots, lots more. 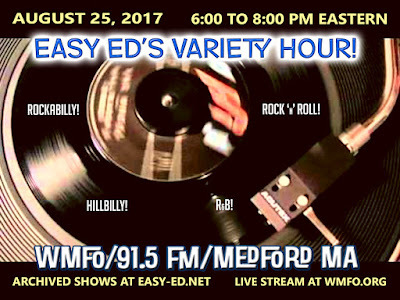 Easy Ed's Record Hop is very happy to be on the bill for the fifth time. 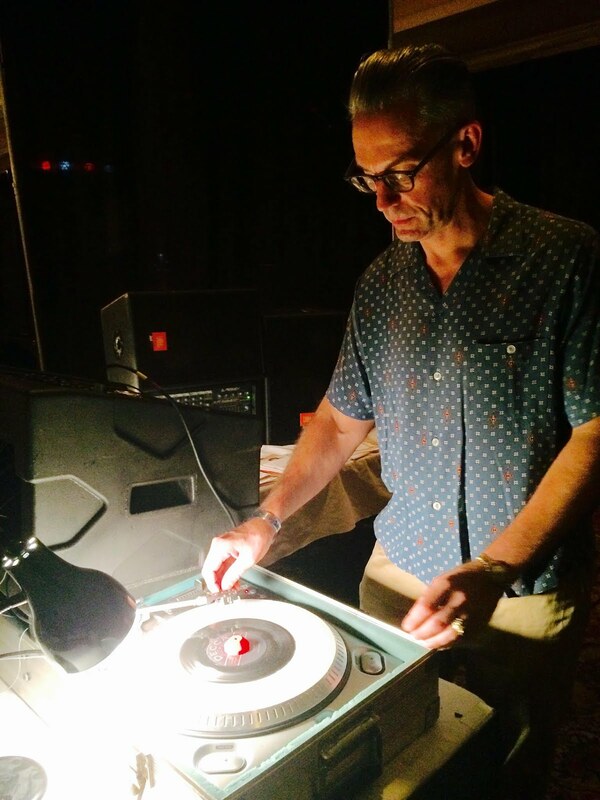 9/13: Stacy Thornton spins with Forrest P.
9/22: Special Primitive Sounds Friday (Soul/Dance Party): Jason Thornton spins with Forrest P.
Sonny Burgess “A Kiss Goodnight” from Hittin' That Jug! The Best Of Sonny Burgess on Self-Released — Rest in Peace, Sonny Burgess. 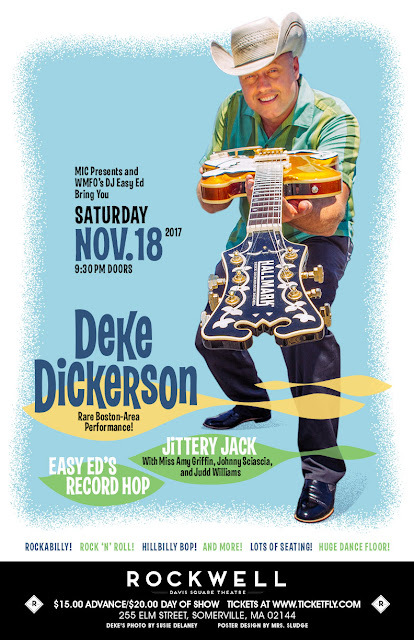 Deke Dickerson & The Ecco-Fonics “Sparkin'” from Number One Hit Record! on Hightone Records — See him 11/18 at the Rockwell with Jittery Jack and Easy Ed's Record Hop! I hope you are all doing well. We're back from vacation and just broadcast a new show on Friday, August 11--the podcast version of which is now available for free download right here. The list of songs played this time out appears at the end of this post. Enjoy! On this show we featured several selections from Holland's Collector Records label. Over the course of 40+ years they have issued tons of LP and CD reissue comps featuring lesser known rockin' stuff. We salute you, Collector Records! We played several King Records 45s (rockabilly and R&B stuff), including this cool one by Milty and Nat that I found at a recent record show. I've been digging around in the music I love and play on the show since I was a young teenager and I still find great songs I've never heard before. I love that! Australia's Scotty Baker sent over his new release on the El Toro label called Lady Killer and we played a great track called "Girl I Need," recorded with Darrel Higham. 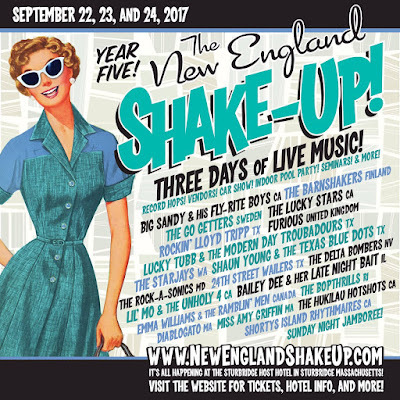 We also played songs by Big Sandy and His Fly-Rite Boys and The Go-Getters, both of whom will be performing at the New England Shake-Up (with lots of other fine bands) September 22-24 in Sturbridge, MA. This fine event also features fantastic DJs from around the globe. 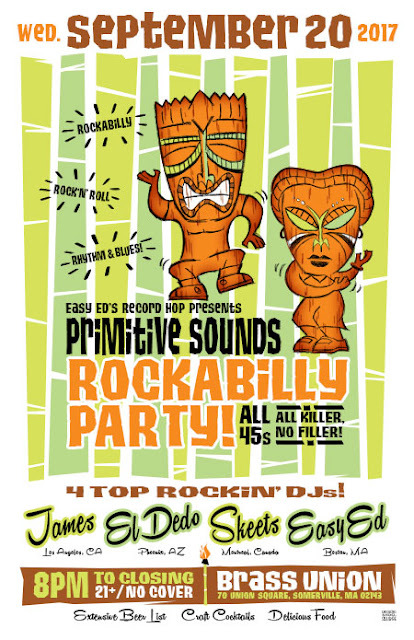 Easy Ed's Record Hop will be spinning again this year. In September our Primitive Sounds DJ night at Brass Union in Somerville is adding a fourth night to the monthly schedule. Things are really cookin' for us over there! We also have some very special one-time DJ events coming up at Brass Union next month. More on that soon! 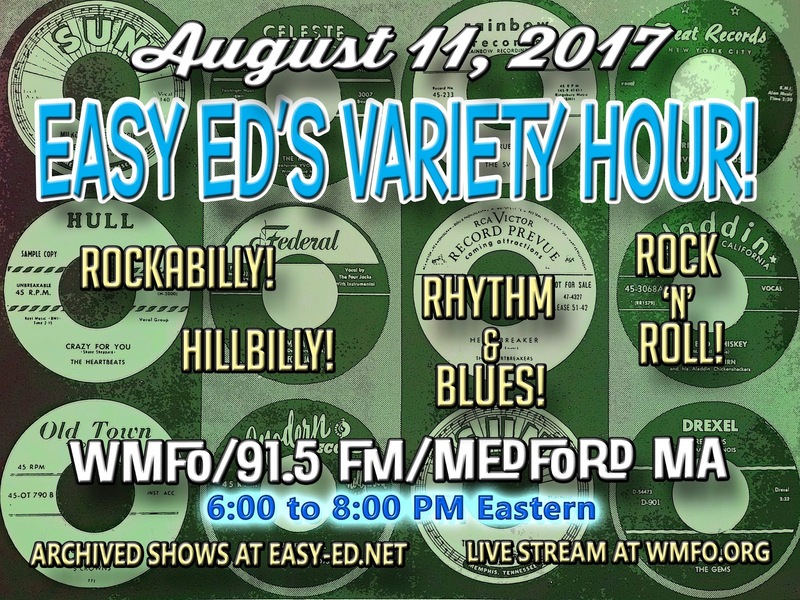 Finally, I want to thank Boston Groupie News for their detailed review of our July 22 show at the Midway (Cranktones, Barley Hoppers, Roy Sludge, Fearless Leaders, Easy Ed's Record Hop). BGN, you guys are great--many thanks! Maybe I'll see you next Friday at the Los Straitjackets show at the Sinclair (with Roy Sludge and Marahall Crenshaw). Van Walker “The Crawl” from Various: 41 Years of Collector Records on Collector Records — Who knows? Charlie Gaston “I Dreamt Last Night” from Rockin’ with Unknown Greats on Collector Records — No one strolls like Gaston. Gary U.S. Bonds “I Wanna Holler” from n/a on LeGrand 45 — LeGrand Records 1987. See him in October at the Ponderosa Stomp! Los Straitjackets “Surf Rider” from Various: Delphonic Sounds Today on Del-Fi Records — See them August 18 at the Sinclair in Cambridge--with Marshall Crenshaw and Roy Sludge!